Orthodontists often come in direct contact with blood and oral fluids of patients when placing or removing fixed appliances and these patients may have tuberculosis or even HIV or they may be undetected hepatitis B carriers as these diseases have a long incubation period, and hence, it is difficult to identify the source of such infections. Even though orthodontic patients are considered low-risk patients for hepatitis B still, every patient should be treated as a possible carrier because, according to a study, orthodontists have the second highest incidence of hepatitis B among dental professionals. According to Mosley and White, the greatest danger for an orthodontist and his staff is from puncturing of the skin with contaminated instruments, sharp edges of an orthodontic appliance, as any cuts or abrasions will allow microorganisms to enter into the body, saliva is about half as infectious as blood [Figure 1]. Dental aerosols, splattering and contamination of instruments can also transmit viruses which can survive for several weeks at room temperature. Before beginning with the patient work, orthodontist should have clear primary goals of infection control in his/her mind. One must always remember that by reducing the levels of pathogens, the risk of cross-contamination should be lowered and any break in aseptic technique should be corrected immediately. Universal precautions should be used religiously with every patient, treating each patient and instrument as potentially infectious. 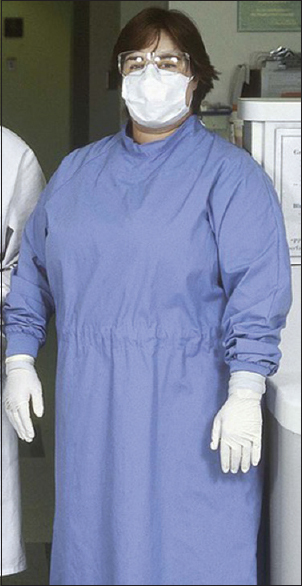 The standards of universal precautions and infection control remain generally unchanged, but technological advancements, new products, new material, and new data require constant evaluation and adjustments of the techniques. It is mandatory to apply the most recent disinfection and sterilization practices to achieve the best results. 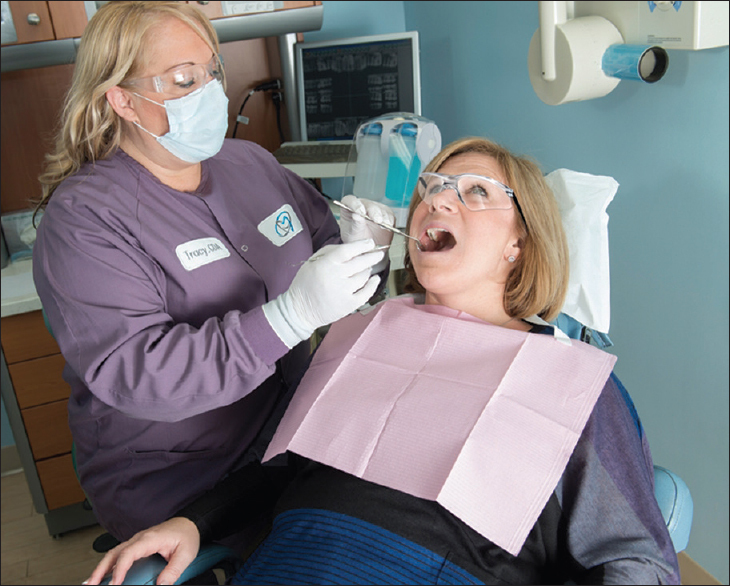 The first instructions for general infection control in dentistry were published by the Center for Disease Control and Prevention in 1986, and are being updated every year in this respect. It destroys all forms of microorganisms including viruses and bacterial and mycotic spores. An instrument will be either sterile or not sterile. There is no in between. Disinfection is the process of destroying or inhibiting most pathogenic microorganisms and inactivating some viruses, hence, reducing microbial contamination to safety levels. It involves the application of chemicals on living tissue to avoid infection. It means an environment free of germs. That is the destruction of all disease-forming microorganisms in the working environment. Starnbach and Biddle established some initial guidelines for asepsis in an orthodontic office. According to them, orthodontist and his staff, supplies and instrument, and operatory surfaces are links in cross-contamination, and these are the areas to which orthodontist must direct his/her attention. Hence, an orthodontist must know about the instrument to be sterilized because of blood and saliva contamination such as scalers, bands, and band removers. 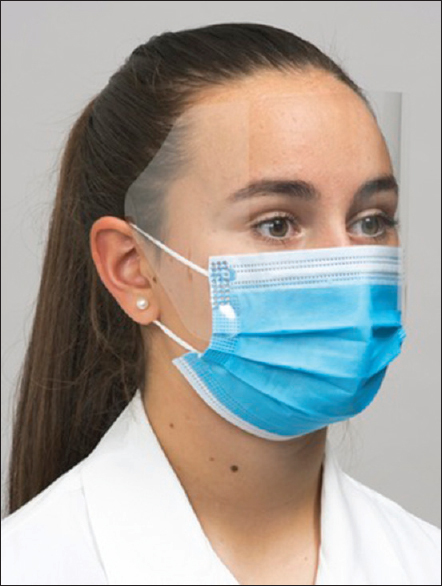 The protection level includes the protection of orthodontist, personnel, and operator site with the primary goal of infection control [Figure 2]. The prevention level includes prevention of orthodontist and his personnel from all kinds of infections while following all possible steps for infection control [Figure 3]. 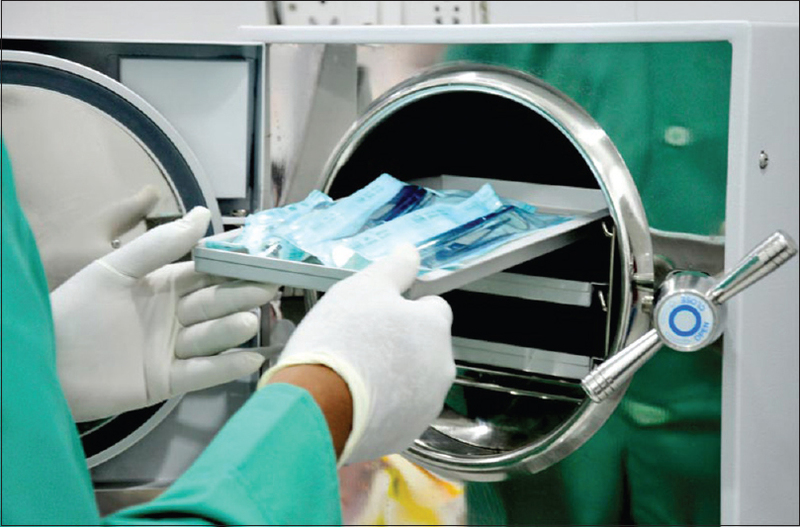 Tertiary level includes the control level sterilization of armamentarium used during treatment as well as the disposal of contaminated wastes for infection control [Figure 4]. Primary level includes the primary goals and the areas of infection control. 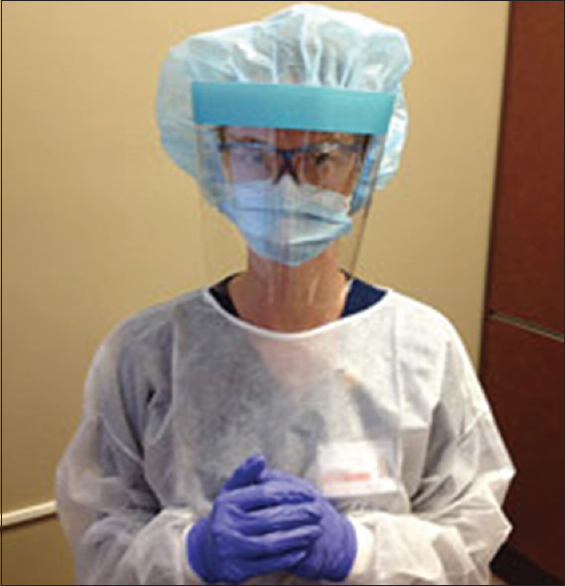 To protect patients and personnel from occupational infections, to lower the risk of cross-contamination by reducing the levels of pathogens, to use universal precautions with every patient (treat every patient and instrument as potentially infectious), and to correct any break in aseptic technique should be the primary goals. 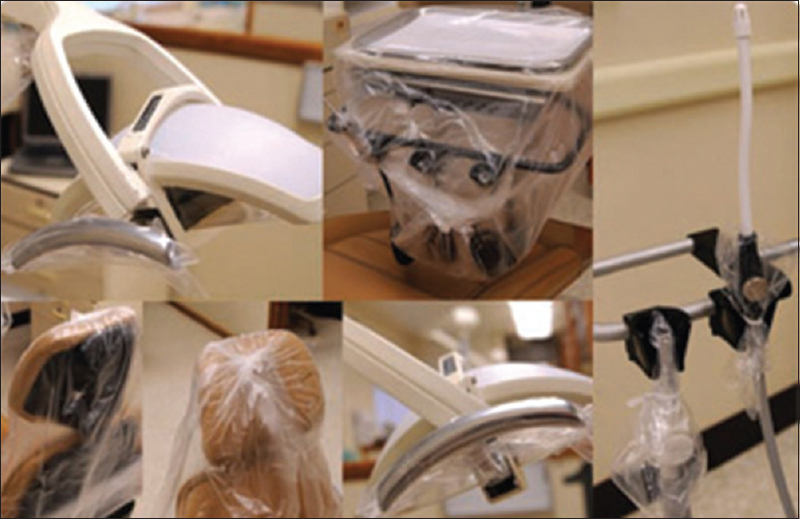 The areas of infection control are orthodontist and staff, instruments, and the operator site. Good personal hygiene is the keystone of protection. The most important aspect of this is frequent hand washing. They should be washed at least for a minute in cold water with germicidal soap. Cold water is suggested because hot water may cause pores to open. Then, the use of a hand disinfectant is administered. As far as the orthodontist is concerned, a reasonably complete medical history of his patient is important in determining who all are more likely carrying pathogenic organisms [Figure 5]. Least Critical: Instruments that do not touch mucous membrane such as distal-end cutter, ligature cutter, torquing keys, arch forming pliers, V-bend forming plier, bracket positioning gauges should be disinfected. The orthodontist should have in mind that chair, table, spittoon, light handles three-way syringes, etc., all become contaminated. It should be wiped frequently with 70% isopropyl alcohol. It is advisable to have straight tubing for the handpiece, three-way syringe, and handpieces should be fitted with a nonretraction valve. The number of tubing and wires which can accumulate dust should be minimized [Figure 6]. This level includes all the steps necessary for infection control which leads to the prevention of orthodontist and personnel. It starts from patient screening and covers all aspect of personal protection, the first line of defense, that is, barrier method. A regular informative medical history of the patient can help to identify factors that assist in the diagnosis of systemic and oral disorders. Many patients often fail to provide the information. Every patient should be treated as potentially infectious. This important fundamental application of infection control is termed as UNIVERSAL PRECAUTIONS. The body fluid and blood precautions substantially reduce the clinical guesswork of a patient's infection status. Repeated exposure to blood and saliva during the dental treatment procedures may challenge the dentist's immune defense with a wide range of microbial agents. In this context, barrier protection and immunological protection are required. For immunological protection, the operator should be vaccinated with available vaccines of proven efficacy to prevent the onset of subclinical or clinical infection. The occupational risk of contacting hepatitis B, measles, rubella, influenza, and certain other microbial infections can be minimized by stimulating artificial active immunity. Barrier protection should be against the range of potential pathogens encountered during patient treatment. 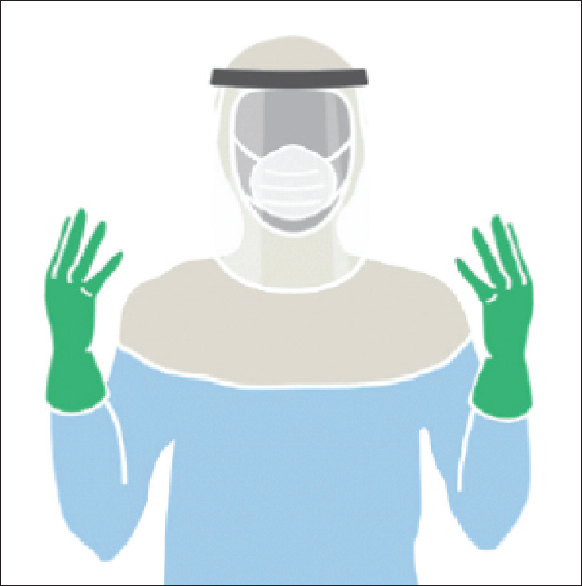 The physical barriers such as disposable gloves, face masks, protective eyewear, head cap, and surgical gowns during treatment procedure will minimize the infectious exposure [Figure 7]. Abrasions and cuts, often found in fingers, will serve as roots of microbial infection entry into the system when ungloved hands are placed in patient's oral cavity – Wet-Fingered Dentistry. Hand washing is not a substitute for use of gloves, but the hands and nails should be cleaned with appropriate skin antiseptics both before wearing and after removing gloves [Figure 8]. 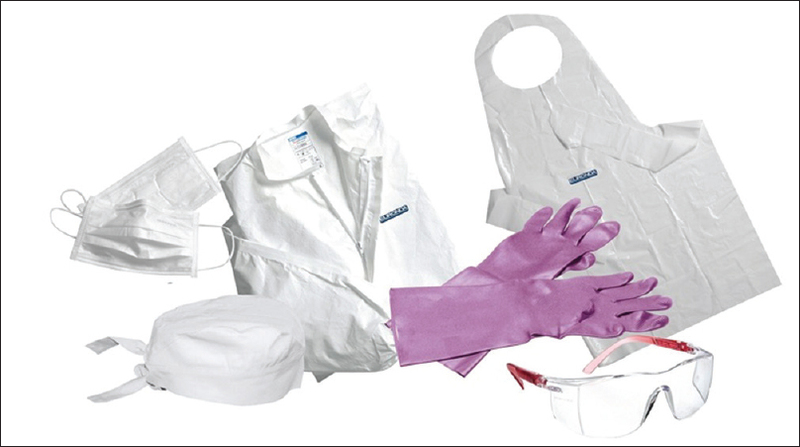 Nondisposable gloves/Heavy utility gloves: Used when handling contaminated supplies or instruments. They can be washed sterilized, disinfected, and reused. 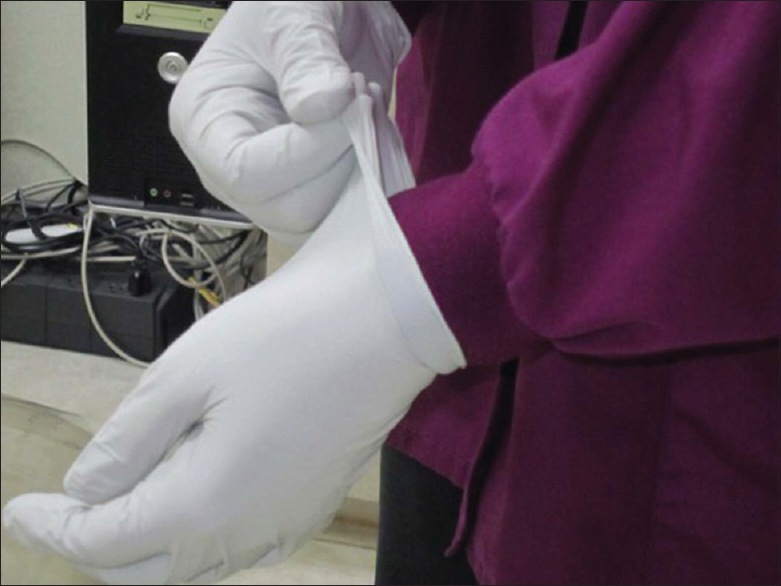 Pinholes are present in all gloves. It can lead to penetration and multiplication of microorganism. Orthodontist's gloves orthodontists, repeatedly handle wire, bands, and ligatures which increase the risk of glove puncture. The orthodontist can use puncture-resistant gloves which are thicker at the palm region, a high-stress area for ligature placement, and thinner material at the fingertips. Improper fitting gloves, reuse of gloves, and washing of with antiseptics are not recommended. Washing gloves increase the size and number of pinholes. Eyes are more susceptible to physical injury and microbial attack because of their diminished immune capacities and limited vascularity. Droplets containing microbial contaminants can result to conjunctivitis. The operator should have a protective eyewear during working. If protection eyewear is available for patients, it is advisable because handpieces, sharp instruments, archwires, etc. are routinely passed over the patient's face. Removing a patient's glasses during dental treatment for the sake of comfort can no longer be recommended [Figure 9]. The best face masks can filter 95% of droplets of 3.0–3.2 microns in diameter and protect the operator from microbe-laden aerosolized droplets. Mask should fit around the entire periphery of the face, and it is advised to change the mask between each patient. Mask should be removed immediately after finishing by tearing it from the back and not left hanging around the neck [Figure 10]. A pair of smooth, slip-on shoes should be kept exclusively for use in the clinics. These should be cleaned at the end of each clinical session. Headcovers provide an effective barrier [Figure 11]. Appropriate dental clinic attire is a misunderstood area as any practitioners place too much emphasis on the choice of attire and not enough emphasis on correct protocol. Although OSHA statement indicates that all exposed skin surfaces should be covered, the short-sleeved uniform may be acceptable. Intact skin is an adequate barrier against bloodborne pathogens. Gowns should be with fewer buckles and buttons. OSHA emphasizes that shoes and street clothes must not be worn during patient treatment. Personnel should not wear clinic attire to and from the workplace. It is mandatory to use the aprons while examining patients or while working in the laboratory. These procedures will sow microorganisms into the fabric of the apron [Figure 12]. After the damage has been done that is instruments or other objects in dental clinics have been exposed to infection-causing microorganisms, this level comes into play. The prime goal is decontamination, disinfection, and sterilization and disposal. Disinfection procedures are advised only for those operatory surfaces and materials that cannot be routinely sterilized, such as dental chair, the table and working surfaces, and for certain orthodontic instruments. Surfaces that are likely to be contaminated by the handling or by the spatter or spill of oral contaminants should be disinfected. Surfaces touched by the dental surgeon are called touch surfaces, for example, unit handles, various controls, light cure unit, micromotor, ultrasonic handpiece, three-way syringe. The surfaces which are contaminated by contact with soiled instruments are called transfer surfaces, for example, instrument trays, tube and handpiece holders. Surface disinfection can be done by scrubbing the surface with the iodophor-soaked gauze pads and allowed to dry. Then, 70% isopropyl alcohol should be used to remove the residue. Other materials such as sodium hypochlorite 5.25% (1:10 dilution), iodophors such as Biocide and combination synthetics (Phenolics, Multicide, and Omni II Vitaphine) and only 0.25% (w/v) glutaraldehyde can be used as surface disinfectants. However, they should be used with care, as repeated contact may damage the skin. Least critical instruments such as ligature tier and distal-end cutter, orthodontic brackets, tying pliers, arch forming pliers, torquing keys, elastomeric rings should be disinfected. Polyurethane elastomers are frequently used in orthodontics as chain and ligature. The unused parts of elastomeric ligatures are generally sterilized through cold sterilization since they are not heat resistant. Disinfection of these materials in a 5% glutaraldehyde solution for 10 min is recommended. Based on two different disinfectants, glass transformation and tensile strength temperature of elastomeric ligatures that are not disinfected are found significantly different than those that are exposed to phenol and glutaraldehyde. Schneeweiss indicated a method of cutting elastomeric modules into smaller sections and covering them with clear tubing, which could then be cold sterilized. Chlorhexidine is an efficient disinfectant to be used on metal or ceramic brackets. Speer et al. evaluated the effect of 0.01% chlorhexidine solution on metal and ceramic brackets. It was found that chlorhexidine does not have a significant effect on the metal bracket's adhesion ability. On the other hand, the attachment ability of ceramic brackets is significantly affected by this disinfecting solution, but the clinical effect does not reach levels below 6–8. When using removable appliances, there is an excessive formation of a biofilm layer that is observed on the retentive areas of springs and hooks, and on the smooth acrylic surfaces of the appliance., Toothbrushes were not efficient enough to remove all the microorganisms on the retentive areas of the appliances. Hence, it is recommended to use antimicrobial agents to eliminate the bacterial biofilm. Disinfection methods of acrylic orthodontic appliances should eradicate pathogenic microorganisms immediately, without damaging the composition of the appliance. Soaking the appliance in a chemical solution could cause decomposition of the acrylic resin molecules. Oral safe is a germicide deodorant that is harmless if ingested. In a previous study, it was found to destroy 99% of microbes on removable appliances during 10 min of submersion. Soaking pencil tips in disinfectant. A study by Ascencio et al. showed that a single touch of a marking pencil tip was sufficient to pick up and retain as many as 350,000 bacteria. This study also showed that conventional wiping of orthodontic marking pencil is ineffective in eradicating infectious microorganisms. The only sure way to avoid potential cross-contamination is to use the inexpensive, disposable markers. Rinse the impression thoroughly under running tap water; remove the excess water from the impression. Dip the impression in a 1:10 solution of sodium hypochlorite for required amount of seconds to ensure maximum contact of undercut with the disinfectant. Wrap the impression in gauze soaked in 1:10 sodium hypochlorite and seal it in a plastic bag for 10 min. Remove the impression and rinse thoroughly under running tap water [Figure 13]. Work against all kinds of germs to reduce the microbial source in amount for protection from unexpected contamination and infection is called decontamination. Stainless steel bands of various sizes are frequently used on molars during fixed orthodontic treatment. Choosing the proper size requires often several trials. If trying of the bands is attempted inside the patient's mouth and determined that the size is not appropriate, the band should be decontaminated from blood and saliva, and autoclaved for future use. Fulford et al. suggested that bacterial multiplication is not observed on the bands that are washed with enzymatic disinfectant before autoclave sterilization. Some of the most common ways that are followed in orthodontic practice include steam autoclave sterilization, dry heat sterilization (DHS), chemical vapor sterilization, and ethylene oxide sterilization, [Table 1] and [Figure 14]. Mazzocchi et al. showed the effects of different methods of sterilization of pliers. In autoclave units, the major problem is rusting and the corrosion of the orthodontic plier's joints and dulling of instrument cutting edges. Chemiclave units cause less corrosion of cutting edge, and it uses alcoholic solution with minimal water, but it emits irritating fumes. Dry heat units require a higher temperature to operate, for example, 320°F–340°F, slower than the other two but they do not produce rust or fumes. The combination of higher grade stainless steel instruments with the use of a sodium nitrate solution dip can minimize the problems due to corrosion as well as those related to dulling of cutting edges. Vendrell et al. showed that orthodontic ligature-cutting pliers with stainless steel inserts showed insignificant difference in mean wear whether sterilized with a steam autoclave or dry heat. Steam autoclave sterilization can be used with no deleterious effects on pliers with stainless steel inserts. Mazzocchi et al. 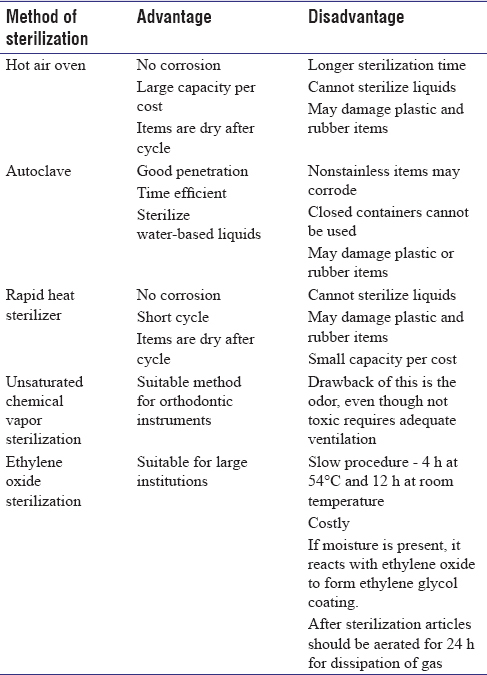 in their study found that surgical stainless steel pliers are the most suitable for use in clinics where instruments are recycled by steam autoclave sterilization. The most important factor in maintaining the longevity of instruments is to take care of them during cleaning, lubrication, and sterilization process. Although Ni-Ti archwires display low load deflection and excellent resilience, their high cost has hampered their universal appeal. As a consequence, both the retention and the cost factor of elastic properties have led to reuse these archwires. To minimize the potential health hazard to the patient who gets a recycled wire, accepted techniques of sterilization must be adopted. Pernier et al. observed the sterilization of six different archwires by autoclaving them for 18 min in 134°C through surface analysis techniques. No significant change was observed on the alloys surface characteristics that would effect their utilization. Mayhew and Kusy studied the effects of sterilization on the surface topography and the mechanical properties of 0.017″ × 0.025″ Nitinol and Titanal archwires. They concluded that neither multiple cycling procedures nor the heat sterilization had a deleterious effect on the elastic moduli, surface topography, or tensile properties of Nitinol or Titanol archwires. Kapila et al. determined the effects of in vivo recycling insinuated by DHS (together referred to as clinical recycling [CR]) on the load-deflection characteristics of nickel–titanium alloy wires (NiTi and Nitinol). The results indicated that both CR and DHS, as well as produced significant changes in the loading and unloading characteristics of Nitinol and NiTi wires. Staggers and Margeson in their study evaluated the effect of sterilization on the tensile strength of 0.016″ beta-titanium, nickel titanium, and stainless steel wires. The tensile strength of both TMA and Sentalloy increased after sterilization and for autoclave and ethylene oxide sterilization, five sterilization cycles, on an average, resulted in a greater increase in strength than one cycle. However, when TMA and Sentalloy wires were sterilized by dry heat, on an average, one cycle increased the tensile strength by more than five cycles. The best method is to discard them after each use. 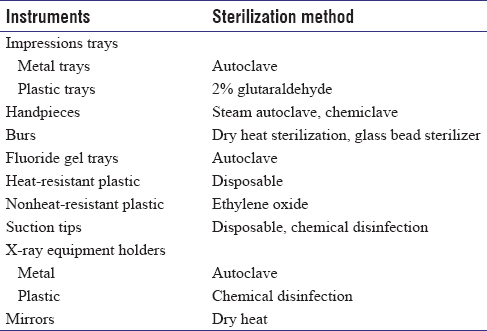 Singh and Arora proposed various methods of sterilization of instruments used in orthodontic office [Table 2] and [Figure 15]. In dental health-care facilities, management of regulated medical waste is done by use of color-coded or labeled container that prevents leakage (e.g., biohazard bag) to contain nonsharp-regulated medical waste [Table 3]. Handling, segregation, mutilation, disinfection, storage, transportation, and final disposal are vital steps for safe and scientific management of biomedical waste in any establishment. 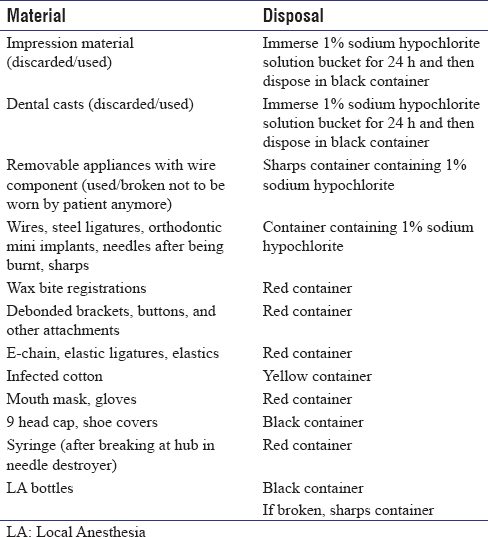 The commonly used items in an orthodontic office and their disposal protocol are shown in [Table 4]. A sharps container is a mandatory part of the overall waste disposal system within the dental office. Sharps container must be rigid, puncture-proof, leak-resistant, and sterilizable,, [Figure 16]. Always keep in mind that every patient is potentially infectious, so all the safety measures must be taken during dental practice. All the three steps that are primary secondary and tertiary should be employed. No method of sterilization is complete in itself, but we should at least try to achieve as high levels of sterilization as possible along with protection, prevention, and infection control. There is room for improvement in knowledge related to sterilization procedures for both general dentist and orthodontist. Toroğlu MS, Haytaç MC, Köksal F. Evaluation of aerosol contamination during debonding procedures. Angle Orthod 2001;71:299-306. Starnbach H, Biddle P. A pragmatic approach to asepsis in the orthodontic office. Angle Orthod 1980;50:63-6. Mosley JW, White E. Viral hepatitis as an occupational hazard of dentists. J Am Dent Assoc 1975;90:992-7. Masunaga MI. Sterilization in orthodontics. Part 3. Corrosion of instruments. J Clin Orthod 1987;21:331-2. Smith GE. Glass bead sterilization of orthodontic bands. Am J Orthod Dentofacial Orthop 1986;90:243-9. Saniç A. Sterilization Applications and Problems in Turkey. Clinics J Microbiol Infec 2003;2:45-58. Spaulding EH. Chemical disinfection of medical and surgical materials. In: Lawrence C, Block SS, editors. Disinfection, Sterilization, and Preservation. Philadelphia: Lea & Febiger; 1968. p. 517-31. Mutlu S, Porter S, Scully C. Cross infection control in dentistry. Enfeksiyon Kontrolü 1996;2:51-9. Moawad K, Longstaff C, Pollack R. Barrier controls in the orthodontic office. J Clin Orthod 1988;22:89-91. Miller CH. Infectious diseases and dentistry infection control. Dent Clin North Am 1996;40:434-55. Available from: http://www.osha.gov/SLTC/dentistry/standards.html. [Last accessed on 2017 Jan 14]. Available from: http://www.cdc.gov/oralhealth/infectioncontrol/guidelines/Surfasept. [Last accessed on 2017 Jan 14]. Mayberry D, Allen R, Close J, Kinney DA. 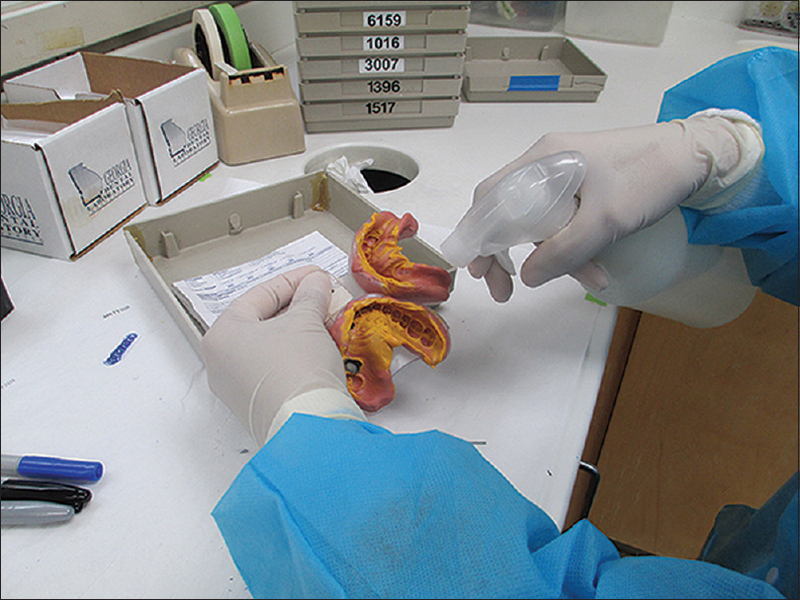 Effects of disinfection procedures on elastomeric ligatures. J Clin Orthod 1996;30:49-51. Evangelista MB, Berzins DW, Monaghan P. Effect of disinfecting solutions on the mechanical properties of orthodontic elastomeric ligatures. Angle Orthod 2007;77:681-7. Schneeweiss DM. Avoiding cross-contamination of elastomeric ligatures. J Clin Orthod 1993;27:538. Speer C, Zimny D, Hopfenmueller W, Holtgrave EA. Bond strength of disinfected metal and ceramic brackets: An in vitro study. Angle Orthod 2005;75:836-42. Wichelhaus A, Bader F, Sander FG, Krieger D, Mertens T. Effective disinfection of orthodontic pliers. J Orofac Orthop 2006;67:316-36. Jaiswal A, Tandon R, Singh K, Azam A, Rohmetra A. New vistas in dentistry: Fema complete review. Int J Curr Res 2017;9:46755-60. Kulshrestha R, Tandon R, Kinger S, Rohmetra A, Singh RV. Obstructive sleep apnea in orthodontics: An overview. Int J Orthod Rehabil 2016;7:115-8. Lessa FC, Enoki C, Ito IY, Faria G, Matsumoto MA, Nelson-Filho P, et al. In vivo evaluation of the bacterial contamination and disinfection of acrylic baseplates of removable orthodontic appliances. Am J Orthod Dentofacial Orthop 2007;131:705.e11-7. Amitha H, Munshi AK. Effect of chlorhexidine gluconate mouth wash on the plaque microflora in children using intra oral appliances. J Clin Pediatr Dent 1995;20:23-9. Petit H, Kolstad R, Chu S. Disinfection of removable appliances. J Clin Orthod 1985;19:293-5. Ascencio F, Langkamp HH, Agarwal S, Petrone JA, Piesco NP. Orthodontic marking pencils: A potential source of cross-contamination. J Clin Orthod 1998;32:307-10. Benson PE, Douglas CW. Decontamination of orthodontic bands following size determination and cleaning. J Orthod 2007;34:18-24. Fulford MR, Ireland AJ, Main BG. Decontamination of tried-in orthodontic molar bands. Eur J Orthod 2003;25:621-2. Kirchhoff ST, Sekijima RK, Masunaga MI, Alizadeh CM. Sterilization in orthodontics. J Clin Orthod 1987;21:326-36. Kalra S, Tripathi T, Rai P. Infection control in orthodontics. J Orthod Endod 2015;1:11-2. 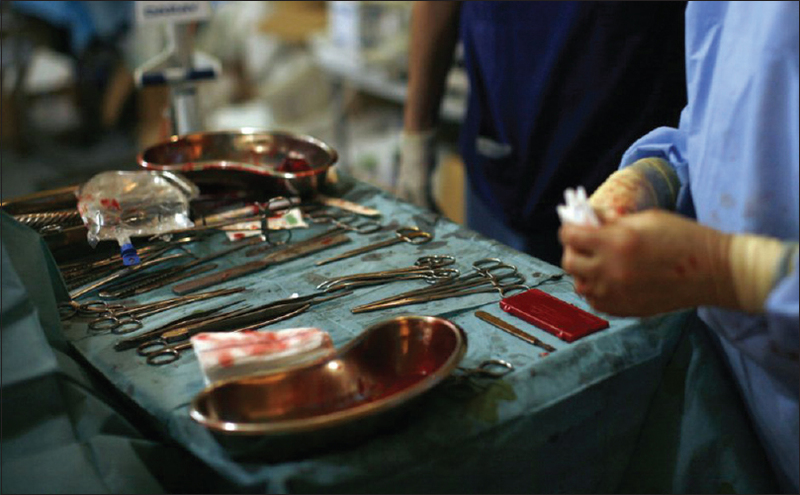 Mazzocchi A, Paganelli C, Marandini K. Effect of three types of sterilization on pliers. Am J Orthod 1997;3:281. Vendrell RJ, Hayden CL, Taloumis LJ. Effect of steam versus dry-heat sterilization on the wear of orthodontic ligature-cutting pliers. Am J Orthod Dentofacial Orthop 2002;121:467-71. Rohmetra A, Kulshrestha R, Singh K, Jaiswal A. Acupuncture therapy in orthodontics – A review. Eur Dent Forum 2016;1:204. Pernier C, Grosgogeat B, Ponsonnet L, Benay G, Lissac M. Influence of autoclave sterilization on the surface parameters and mechanical properties of six orthodontic wires. Eur J Orthod 2005;27:72-81. Mayhew MJ, Kusy RP. Effects of sterilization on the mechanical properties and the surface topography of nickel-titanium arch wires. Am J Orthod Dentofacial Orthop 1988;93:232-6. Kapila S, Haugen JW, Watanabe LG. Load-deflection characteristics of nickel-titanium alloy wires after clinical recycling and dry heat sterilization. Am J Orthod Dentofacial Orthop 1992;102:120-6. Staggers JA, Margeson D. The effects of sterilization on the tensile strength of orthodontic wires. Angle Orthod 1993;63:141-4. Singh D, Arora S. Sterilization in orthodontic clinic. Res Rev J Dent Sci 2015;3:8-15. Rohmetra A, Tandon R, Singh K, Jaiswal A. Acupressure therapy in orthodontics: A review. Int J Orthod Rehabil 2017;8:26-30. Blenkharn JI. Standards of clinical waste management in UK hospitals. J Hosp Infect 2006;62:300-3. Jaiswal A, Tandon R, Singh K, Chandra P, Rohmetra A. Body dysmorphic disorder (BDD) and the orthodontist. Indian J Orthod Dentofac Res 2016;2:142-4. Jaiswal A, Tandon R, Singh K, Rohmetra A. “I don't look good” unexplored parameter of orthodontic treatment. Int J Orthod Rehabil 2017;8:18-20. 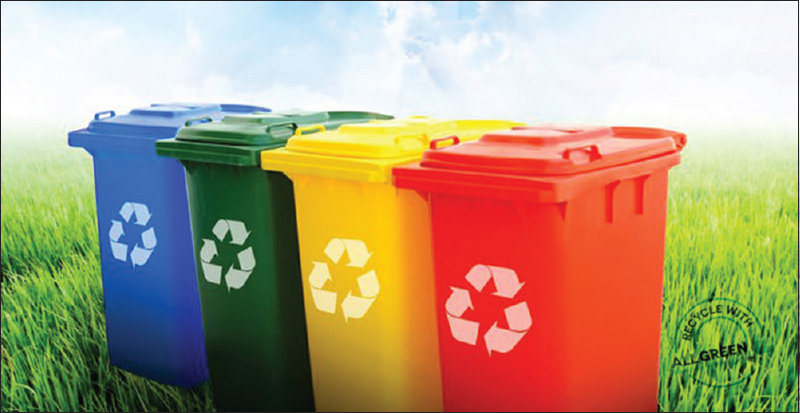 Pasupathi P, Sindhu S, Ponnusha BS, Ambika A. Biomedical waste management for health care industry. Int J Biol Med Res 2011;2:472-86.